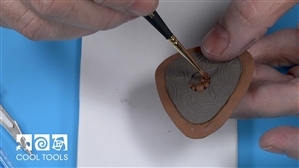 In this video, Cindy switches gears from using the Silhouette Curio™ to a layered pendant using Hadar's One-Fire Low Shrinkage Steel XT and One-Fire Flex Dark Champagne Clay. Using clay sheet, she domes the layers, pastes them together and adds embellishments to the pendant. This fun pendant has endless options!